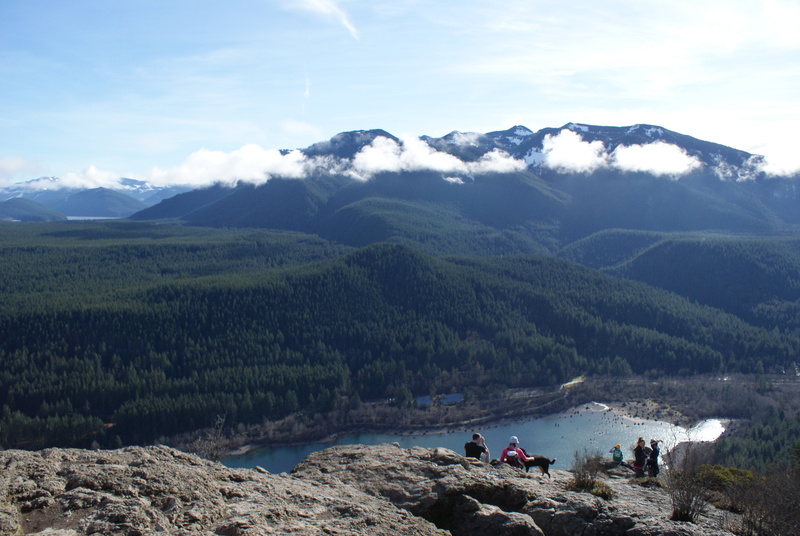 On Friday a week and a half ago we went on a hike up to a fabulous viewpoint called Rattlesnake Ledge. There are no rattlesnakes there or at the lake with the same name below. 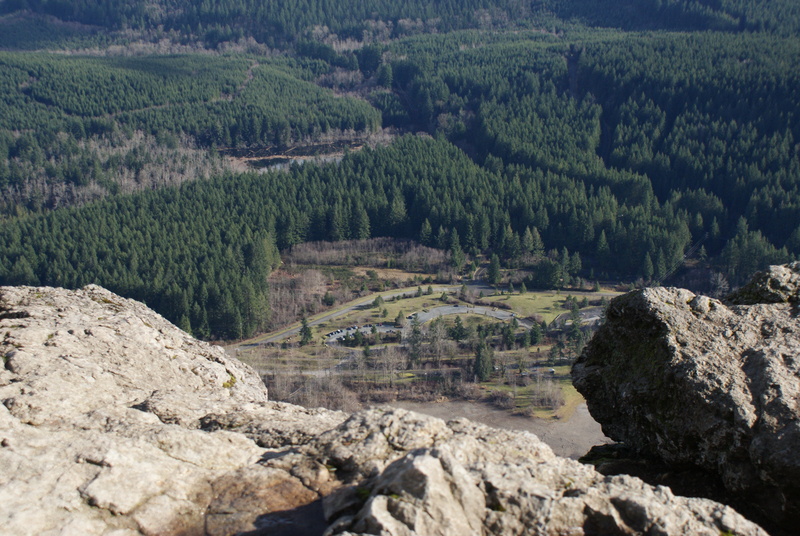 But you can see for miles on a clear day, and the hike is short. Our friend Jessie was able to come with us again, and was even sweet enough to drive. From the parking lot we could see a dusting of snow on some of the protected areas on the ledges. A raptor soared overhead, and ravens squawked occasionally. It was sunny and temps were in the 40s. It has been several years since I’ve been up this trail, and it was prettier than I remembered. 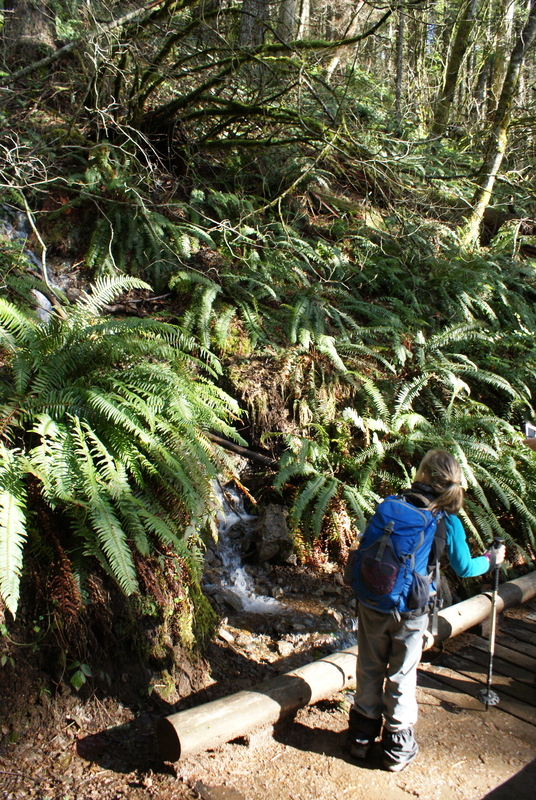 Ferns and Oregon grape plants cover the forest floor, mosses adorn the trees. 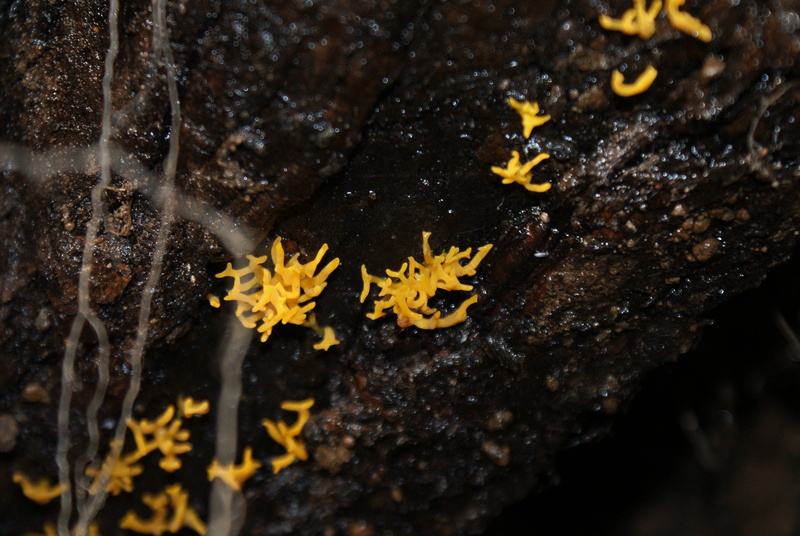 We saw a couple of saturated mushrooms, but otherwise much of the forest seems dormant for the winter. The trail climbs steadily for much of its 1.9 miles, but it is graded nicely and there are few obstacles to impede little legs. There are some muddy spots where water is flowing over the trail. 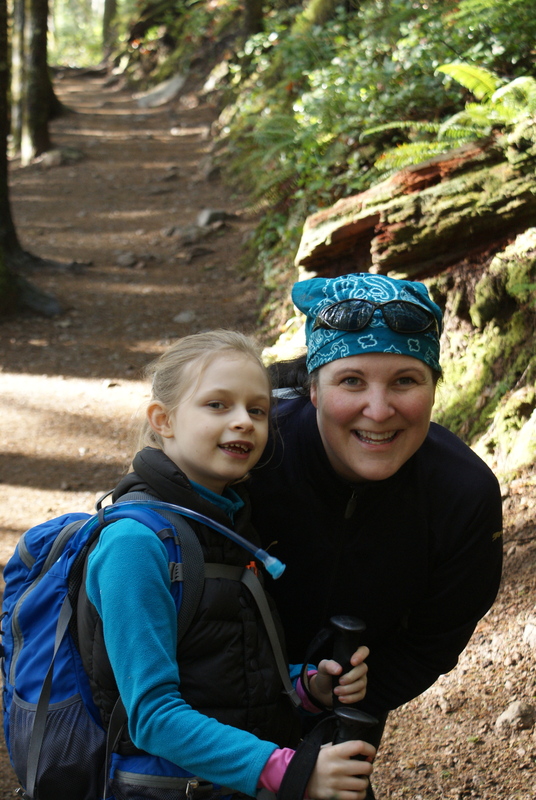 If your children are like Annika, they will enjoy squelching through these sections. We took a couple of short breaks for snacks, water, and adjusting clothing. It took us almost exactly 2 hours to make it up to the first ledge. The wind was blowing up there, and it was colder than the trail. 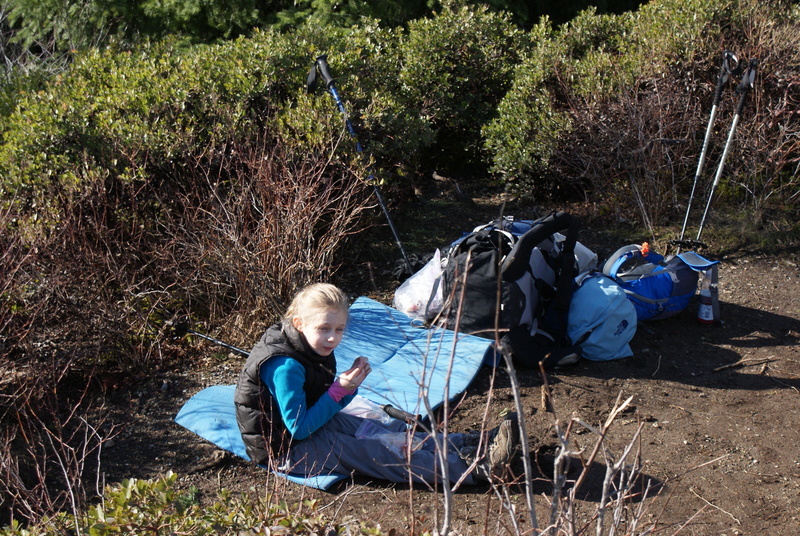 We found a flat spot away from the edge to dump our packs and give Annika a safe place to hang out. She wasn’t feeling too secure at that height. Gabe was more advernturous, and I let him go out on the rocky portion with Jessie to sit and eat. 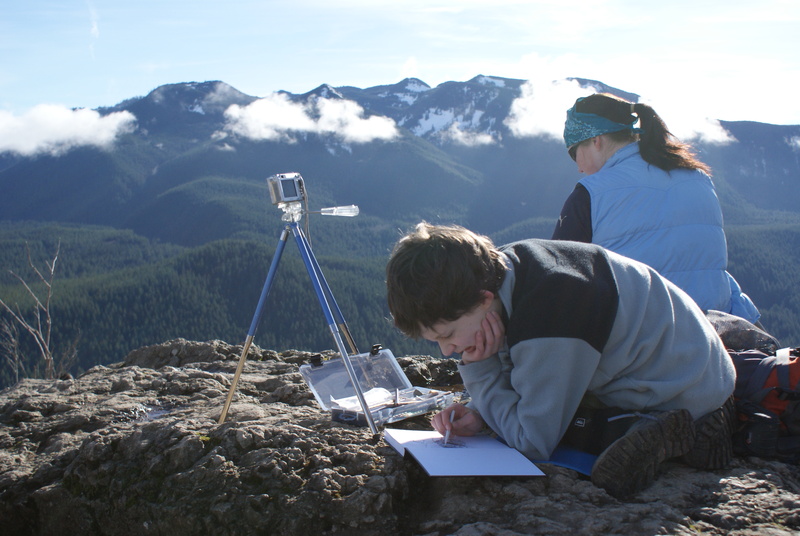 He got out his sketchbook and colored pencils and got to work sketching the amazing view. 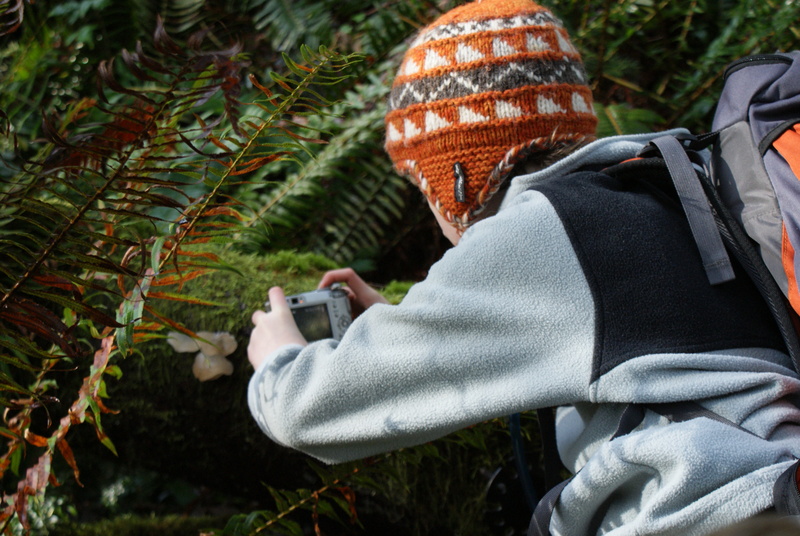 He had brought our old point and shoot camera and a little tripod along. 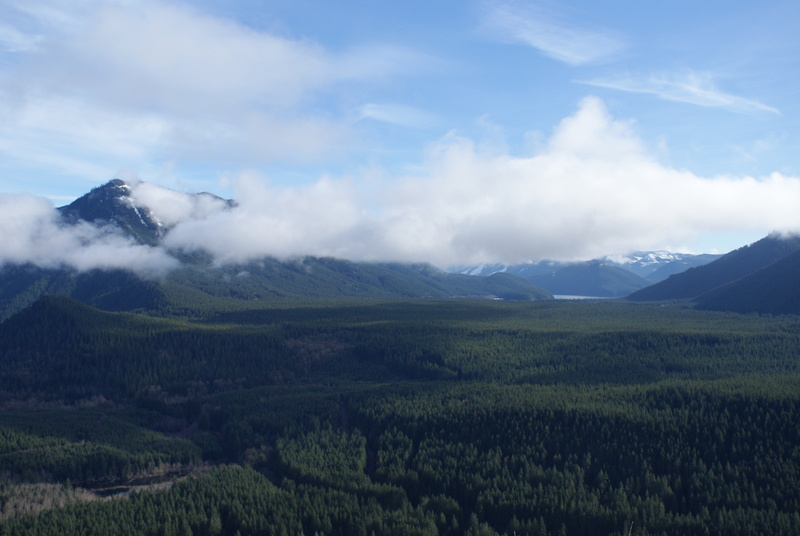 We could see up to Chester Morse Lake and watched various other peaks play hide and seek in the clouds. We felt pretty lucky to be in full sun, while Mt. 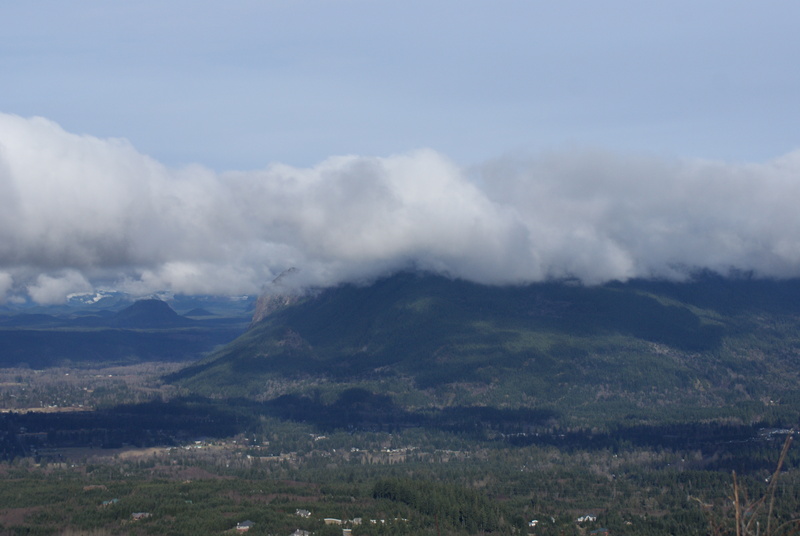 Si and Teneriffe, and Washington across the valleys were covered with clouds at the tops. It was warm in the sheltered little alcove we had. We ate a good lunch and had our hot cocoa. Gabe drew. We spent about an hour and a half up there enjoying the view and people watching. The kids declined to go up to the other two ledges. Annika was shaky enough up there, and didn’t want any more exposure. We walked back down, taking a break or two on the way. The afternoon light slanted through the trees, and it was pleasant in the relative January warmth. 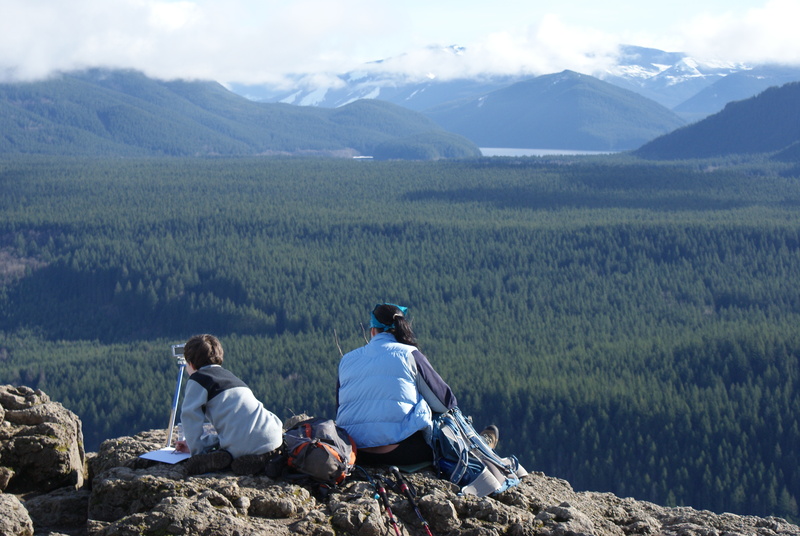 The kids enjoyed this hike, and I think it’s great that they are now old enough to appreciate the views. I’m really proud of them for making the climb up and back. Find directions on the WTA website. There are different parking areas at the lake; some require the state Discover Pass. If your child will not stay near you or obey instructions for where not to go, do not take them here. 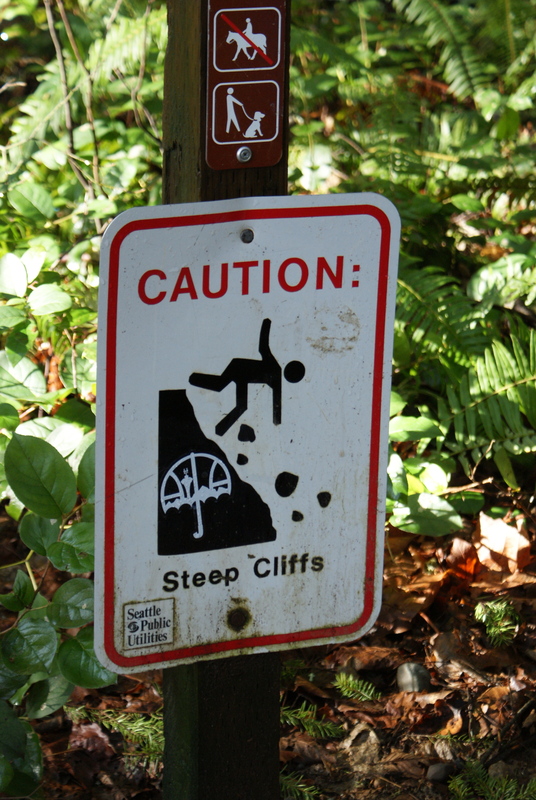 There are fissures in the rocks and steep, precipitous drops that are dangerous. 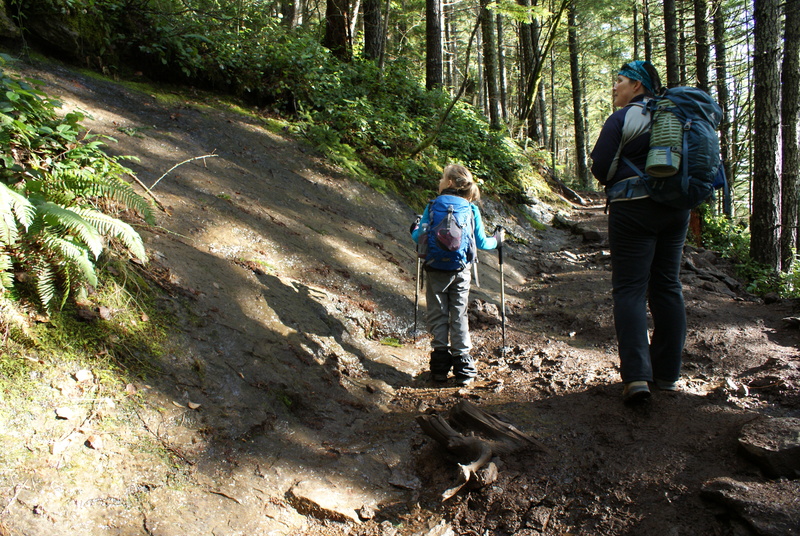 There is not a whole lot to keep a young child’s interest along the trail itself, though the forest is pretty. 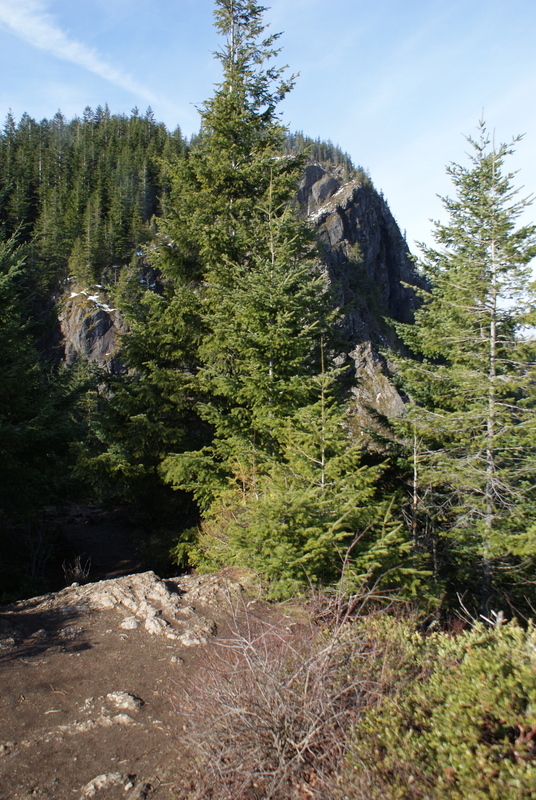 This hike is 4 miles round trip with 1160 ft. elevation gain. 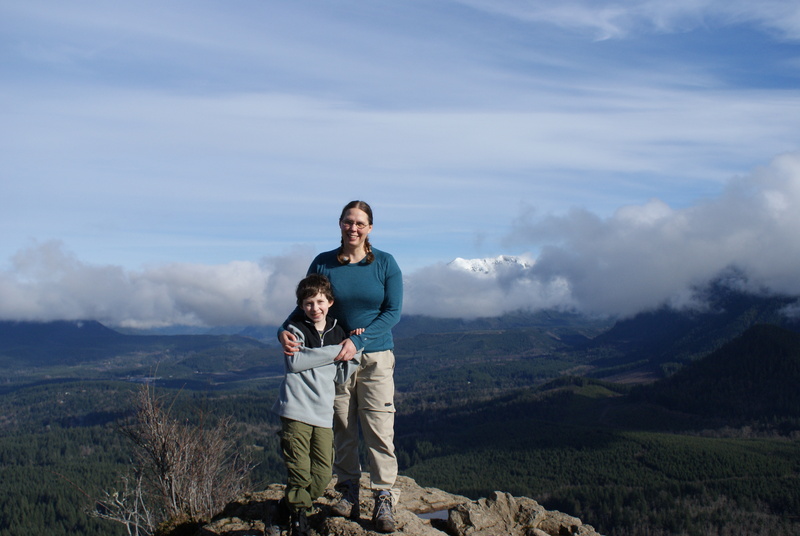 If you have time after your hike, consider visiting the Cedar River Watershed Environmental Learning Center. It’s free and one of my kids’ favorite places to visit.